If you or a family member was injured at work, it is crucial to that you seek the counsel of an experienced attorney. 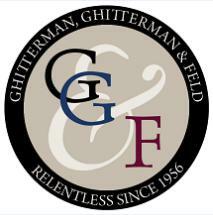 Ghitterman, Ghitterman & Feld specializes in helping employees protecting their rights. We pride ourselves on our reputation to obtain the best result possible due to our expertise, tenacity, and accessibility. We maximize recovery for our clients by leaving no stone unturned. We compel the employers, insurance companies and governmental agencies to provide you with all the benefits you are entitled to receive by law. With Ghitterman, Ghitterman & Feld your rights will be protected. We offer a free consultation and work on a contingency fee basis, which means you pay no attorney’s fee if we do not obtain a recovery on your behalf. For more information, please contact our office for an appointment. Helping employees for over 60 years. With decades of experience, the staff at our law firm can answer complex questions regarding workers' compensation and personal injury cases. We understand the frustration and worry that our clients feel when they face financial peril due to lost wages and medical bills. It is our goal to provide the legal guidance they need to provide for their family and return to a pre-accident health. If you have been injured on the job, you need an attorney who can help you pursue all potential sources of compensation. Our law firm is equipped to do that. Certified specialists in workers' compensation. We have taken the extra step necessary to become certified specialists in workers' compensation. When you need expert help or skilled legal guidance, it is wise to schedule a free consultation at Ghitterman, Ghitterman & Feld. Whether your injury is the result of a single accident such as being struck in the head by a falling object, repetitive stress such as making the same movement over and over while on the job, or toxic exposure in the case of asbestos, our California lawyers can help. The attorneys of Ghitterman, Ghitterman & Feld have more than 57 years of experience fighting for workers who have been injured on the job. We have more than 50 years of experience in workers' compensation and other disability benefits, such as Social Security Disability. Let us put that experience to work for you. We have helped many people receive disability retirement benefits, along with other benefits they are entitled to under the law. If you have been wrongfully terminated, not paid the wages you earned or are suffering workplace discrimination, our Santa Barbara lawyers handling employment law issues can help. If you are injured in a work-related accident, a car accident or any other accident that was caused by someone else's negligence, you have the right to hold that person or party accountable for the harm done to you.